Below is a list of the mobile applications provided by The Church of Jesus Christ of Latter-day Saints. Find links to these apps at mobile.ChurchofJesusChrist.org. Book of Mormon. A free mobile app used to share a copy of the Book of Mormon with a friend. This is not the full-featured version of the scriptures available in the Gospel Library app. It is a simple digital version of the Book of Mormon without footnotes or cross-references. Contains text in 32 languages and inline streaming audio recordings in 5 languages (English, Japanese, Korean, Portuguese, and Spanish). Church Youth. Get the latest content from youth.ChurchofJesusChrist.org on your mobile device. Uplifting content includes videos, articles, music, and Mormonads. It also allows youth to share content with their friends. Available in English for Android and Apple iOS. FamilySearch Indexing. This mobile app was released in beta, but is no longer available. Learn more. FamilySearch Memories. This app helps you collect, preserve, and share your favorite family memories. Record photos, video, and audio to capture events, heirlooms, pictures, and family history stories. You can tag people and events, and all this syncs to FamilySearch.org. You can also make voice recordings and it will turn the audio into text. Use the app even without Internet access, then sync to FamilySearch.org when you are connected. Currently available for Apple iOS 7 and above for iPhone and iPad. An Android version is coming. FamilySearch Tree. A mobile companion to FamilySearch.org. It lets you view the details of your family trees from FamilySearch.org. You can see connections and browse or add stories and photos. The app works even without Internet access, then syncs to FamilySearch.org when you have a connection. Gospel Library. Download and study the scriptures, general conference addresses, Sunday manuals, and other Church content. The Gospel Library app allows you to search, bookmark, annotate, link, and highlight content. Available for most platforms. See mobile.ChurchofJesusChrist.org. 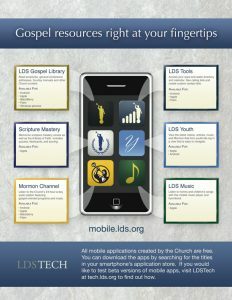 Find links to these apps at mobile.ChurchofJesusChrist.org. Android apps can be sideloaded onto Kindle Fire, Nook Color, Nook Tablet, or a generic Android tablet. See instructions for sideloading. For more information about the official mobile apps provided by The Church of Jesus Christ of Latter-day Saints, see mobile.ChurchofJesusChrist.org. 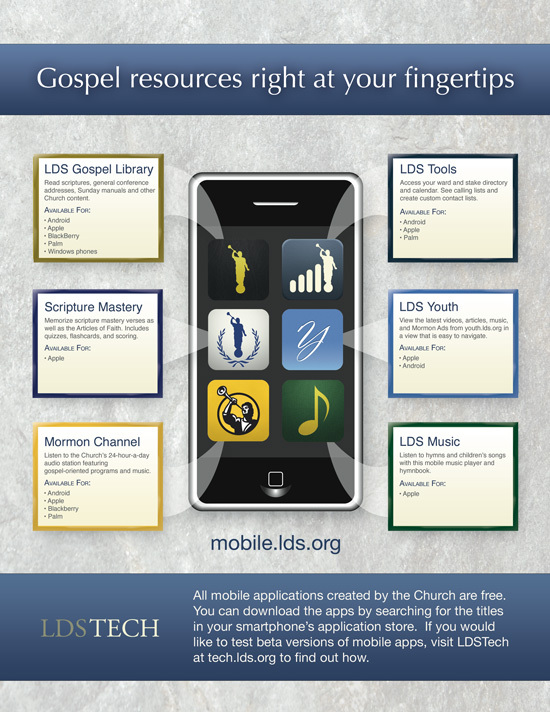 See an infographic of the LDS mobile apps available from the Church. Useful as a handout to help others become aware of the mobile apps. Need LDS content for your e-reader? Go to the library of EPUB files of Church publications. There are no current plans to update the current Church Blackberry apps (Gospel Library, Mormon Channel, or LDS tools) to work on Blackberry 10. See a list of the official LDS Church websites.